I found myself in a state of limbo for a while. I didn't quite realize doing the 9 day Annual Craftmen's Fair in August, then 3 workshops in 3 weeks at Snow Farm, and dealing with a dog I rescued knocked me me out of a loop. Only a week ago or so did I finally get the urge to work and did quite a bit of work. Here's a box I did for the upcoming Baskets, Bowls and Boxes exhibition at Gallery 205, League of NH Craftsmen HQ. 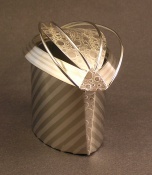 The box is called "Soaring through Time" and is made of nickel with sterling inlayed stripes and patterned sterling. There's something about boxes that really speaks to me - it's a container that can hold anything you want. Small boxes are particularly appealing, so I usually make an unusual, non-traditional box once in a while. Generally, I like to jazz up the metal by using stripes, patterns, textures, odd shapes, odd lid configurations, and sometimes funky bases. Maybe I should start making more boxes! Although, my boxes are not that small and this box is one of the biggest I've made, a good 4.5:" long by 4" tall. Anything bigger than 5" starts to get very tricky to solder for metal expands under heat and it can be hard to control the expansion movement of metal as you are trying to solder it. It's doable, just more patience and lots of binding metal together to hold it during soldering. Anyway, enjoy the box!